It was the audible mutter heard ‘round the world. During the third and final presidential debate, Donald Trump uttered the phrase, “such as nasty woman” to Clinton, who was answering a question and had just made a comment about Trump potentially not paying future taxes. There was a collective gasp from everybody watching the debate. Clinton played off the comment like the iconic women she is. She ignored the comment, and effectively inspired women all over the world. 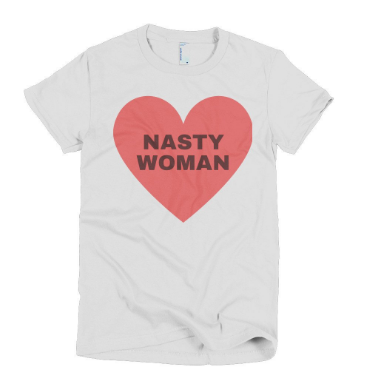 In less than a day, the phrase “Nasty Woman” had been reclaimed and with that, came the merch. Because it’s 2016 and this is what we do. 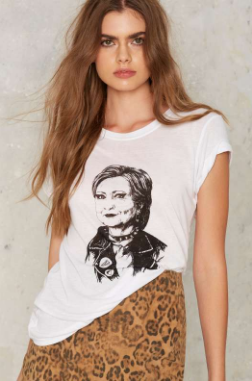 The e-commerce website, which has reclaimed the title of “nasty” woman immediately jumped on the bandwagon and designed this t-shirt complete with a hand-drawn Hillary Clinton. The proceeds of the $48.00 shirt will go to Planned Parenthood. Win for women all around! 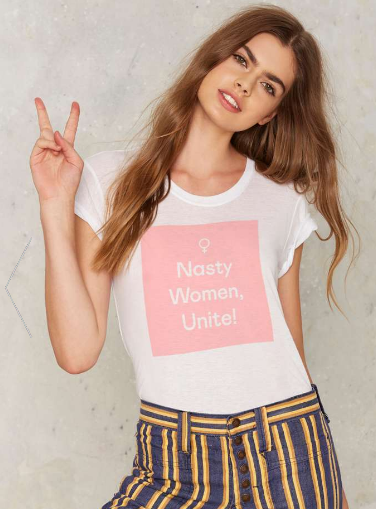 The online retailer also designed this spectacular t-shirt so nasty women all over the world can come together and be nasty women. Like previous shirt, the $48.00 shirt will donate proceeds to Planned Parenthood. From Google Ghost, this $25.00 t-shirt will donate half of the proceeds to Planned Parenthood. 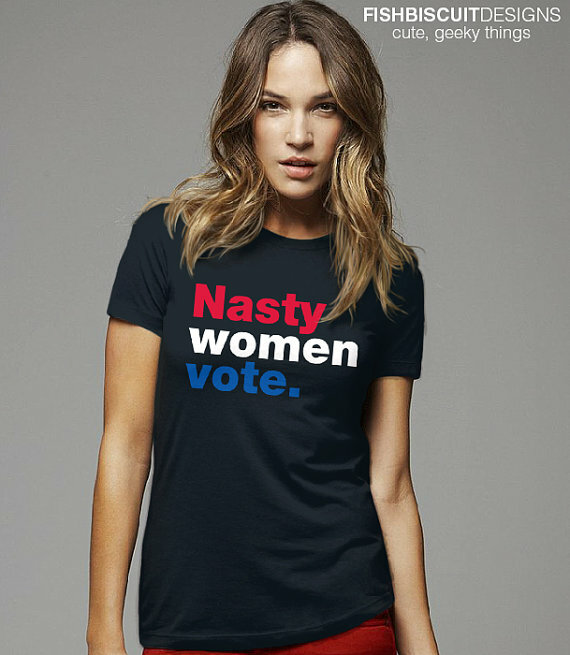 The design is simple, with the nasty woman phrase complete with a heart, but beautifully elegant. 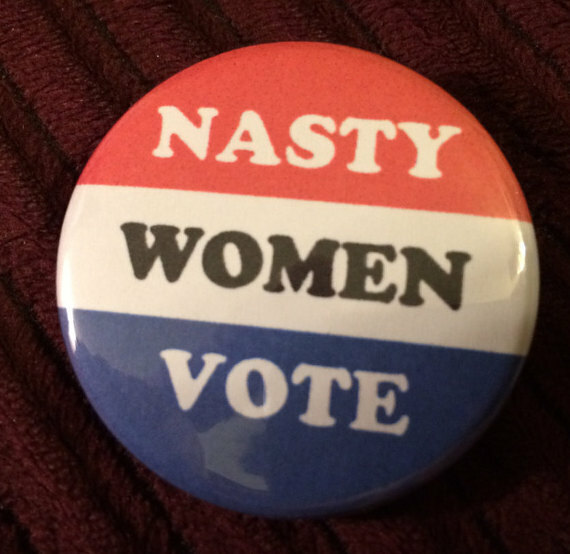 Campaign pins are an iconic election staple so it’s no surprise that the nasty women soundbite has been turned into a killer pin. Emulating a classic red, white, and blue pin, it’s such an iconic souvenir from a truly bizarre time in American history. The button is sold for $2.00 at Etsy shop, Masked Bandit Buttons. Imagine Olivia Pope ditching her iconic long-stemmed wine glass for this incredible wine glass. 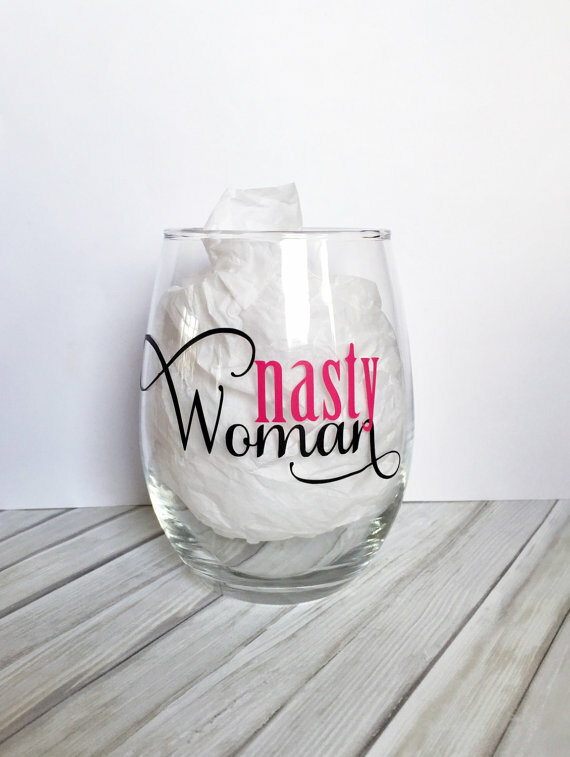 This killer wine glass from Etsy store Chic Tweet Boutique is sold out but get on the waiting list and one could be yours for $10.00! Ever since Donald Trump debuted his silly “Make America Great Again” we’ve seen it parodied in almost every way possible. 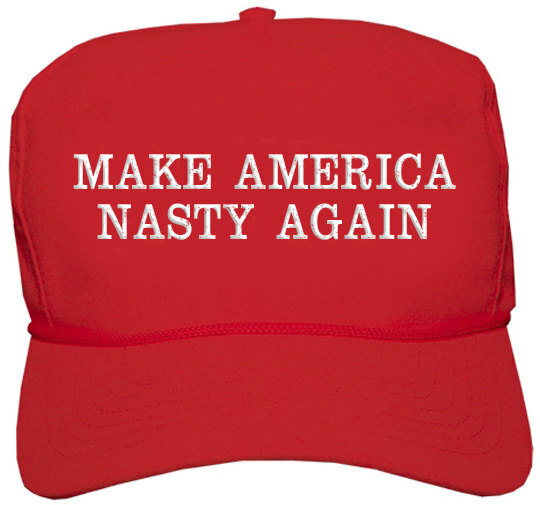 The “Make America Nasty Again” hat has to be one of our favorite renditions as it takes Trump’s own words and spins it against him. Buy it at the Etsy store Magic Society Store for $25.00. 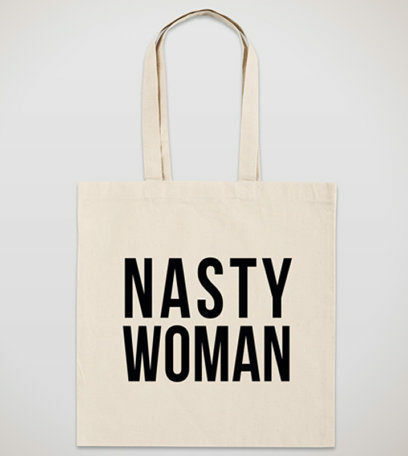 Tote bags make a statement so owning a tote bag with “Nasty Woman” written on it is the ultimate statement. It’s simple and chic at the same time. Get it at Etsy store The Sentimental Fools for $25.00. If these four words look familiar, it’s because they have all been used by Donald Trump to insult Hillary Clinton. The unisex tank top makes a bold statement and can be found at the Etsy store Smashtransit for $25.00. We see the above pin, and raise you a killer t-shirt. This shirt, found in Etsy store FishBiscuit, the shirt can be found in LITERALLY any size for just $19.95. 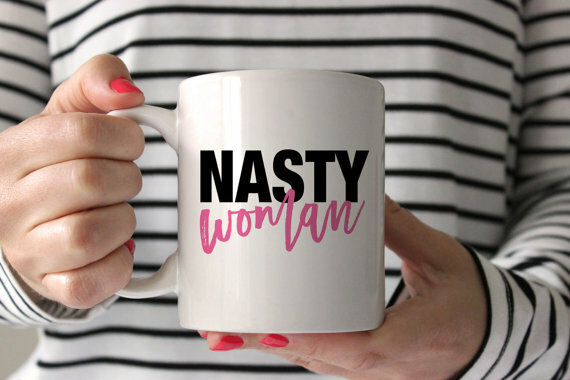 If you want to trade your wine for caffeine, check out this cool nasty women coffee (or tea) mug. It’s such a great way to start the morning and we want to start every day with a cup of coffee out of that mug. Get it at Etsy store SwankyPress for either $16.00 for an 11oz. mug or $18.00 for an 15oz. mug. This is the year of the nasty woman. Let’s own it and collectively put an end to the gross, sexist rhetoric Trump uses to describe women.